When you think of talented NFL running backs, guys like Adrian Peterson come to mind, and rightfully so. Peterson is not only one of the best running backs in the NFL, but possibly one of the best backs to ever play the game. While there are a few others like Peterson who immediately earn consideration as top-tier NFL backs, what about the guys who just don’t get the love they deserve? The ones who are underrated every year? Let’s talk about those guys, and check out the most underrated running backs as we head into the 2016 NFL season. Chris Ivory might be underrated, but at the very least, he’s no longer underpaid. The former New York Jets running back signed a five-year, $32 million deal, which includes $10 million in guaranteed money. Apparently, it paid off for Ivory to finally hit that 1,000-yard mark with the Jets in 2015. Ivory isn’t a consistent force, but he has gone out and done his job on a yearly basis. Since finally given a real opportunity back in 2013, he has responded by topping 800 rushing yards in each of his three seasons with the Jets, while scoring 16 touchdowns. Ivory is a bruising back who’s tough to bring down. Jacksonville fans should love the mindset he’ll bring to town. If people aren’t talking about Cam Newton; they’re talking about Carolina’s defense. If they aren’t talking about the defense, then it’s Greg Olsen or Kelvin Benjamin. Where’s the love for Jonathan Stewart? Over the past two years, Stewart has missed three games in each season, but still put together solid seasons, with 2015 being very impressive. In 2014, he rushed 175 times for 809 yards (4.6 yards-per-carry), and in 2015, he rushed 242 times for 989 yards (4.1 yards-per-carry). Stewart has been a consistent threat, which helps ease the pressure off Newton. While he’s not the focal point of the offense, the job he does still deserves its fair share of recognition. What Gio brings to the Bengals is far more than rushing touchdowns. He brings a dynamic ability that few players in the NFL have. Bernard can not only dominate in the run game, as he’s never averaged fewer than four yards per carry in a season, but he also catches a ton of passes out of the backfield. Throughout his three NFL seasons, Bernard has caught 148 passes for 1,335 yards and has rushed for 2,105 yards as well. In total, Bernard has scored 17 touchdowns, and if not for Jeremy Hill’s presence on the goal line, that number would likely be a whole lot higher. Time to give Bernard some much-deserved praise for the work he does. 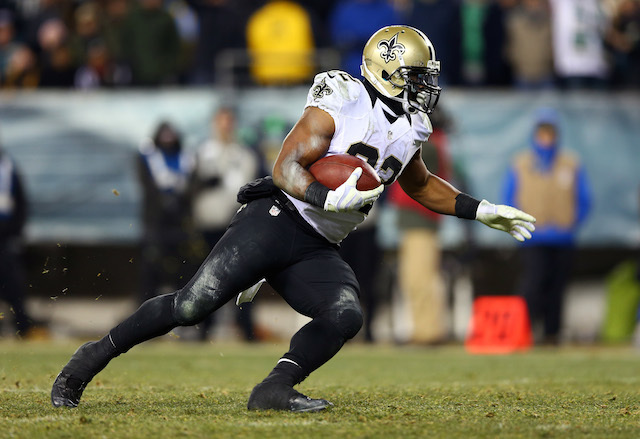 We can say this about Mark Ingram — he does get some love. He’s not as overlooked as the three names we’ve mentioned, but he’s still not given the credit he deserves. The past two years specifically have been strong for Ingram, but injuries have kept him from leaving his mark as one of the top running backs in the game. Ingram missed seven games over the past two years, but still rushed for 1,733 yards and 15 touchdowns over that span. For good measure, he’s also caught 79 passes for 550 yards. If Ingram was able to play in all 16 games (which will happen sooner rather than later), he would easily surpass the 1,000-yard mark, while also scoring double-digit touchdowns. It’s hard to figure out exactly what happened during Lamar Miller’s time with the Miami Dolphins. Regardless, he skipped town in free agency, signing a four-year, $26 million deal with the Texans. It’s probably a safe bet that the Texans will utilize his skills far more than the Dolphins did. Over the past two seasons, specifically, Miller totaled 410 carries for 1,971 yards and 16 touchdowns. He also caught 85 passes for 672 yards and three additional scores. It’s not that his workload wasn’t a decent size, it’s more about the fact that when Miller got the ball in his hands, good things seemed to happen. Even with that said, the Dolphins chose to shy away from it at times, as there were six games alone in 2015 in which he had single-digit carries. Miller’s talent is undeniable, and now we should be able to see what he’s really capable of with Houston this season.